The First Unitarian Universalist Society of Middleborough was officially founded in 1889, but the church can trace its lineage back almost another half century. In 1842 the First Universalist Society formed in town. Over time the group declined and in 1872 decided to disband and sell its building lot. Then, in the late 1870s, another group of liberal religious people began meeting in various homes and halls, inviting ministers from neighboring churches to speak. 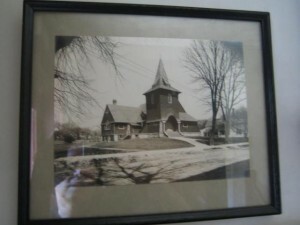 On March 5, 1889, a group of 22 came before Justice of the Peace Francis M. Vaughn to form the Unity Church of Middleborough and named five members to its Parish Committee. Some of the former First Universalist Society members joined this group. 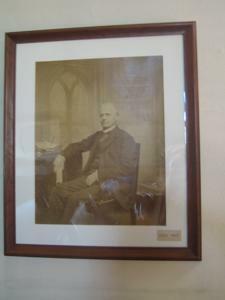 On June 29, 1889, the church hired Unitarian minister the Rev. William M. Ramsey of Salem for a term of one year and a salary of $1,200. That fall Enoch Pratt donated a lot on Pearl Street, and the church began erecting a building, which opened for services on October 26, 1890. A music committee formed in 1892, and the “Lend-A-Hand Club” raised money to buy a Woodberry and Harris tracker pipe organ, which we still actively use today. The church wasn’t big enough for the organ, so members raised $579.48 to add to the building. Other early church organizations included the Sunday School, Ladies’ Sewing Circle, Afternoon Alliance, Boys’ Mandolin and Guitar Club, and Layman’s League. For several years a free kindergarten operated in the Parish Hall. In the early 1900s David Pratt gifted us a more central and visible parcel of land on Main Street next to the Town Hall. The church building was cut into three pieces, then pulled by oxen through the streets and remounted on its current stone foundation with a new porch in 1907. Our forbears’ resourcefulness and love of their church still impress us today. The society called its first woman minister, Clara Cook-Helve, in 1929 at a salary of $1,800, and she served through the Depression. She inaugurated a popular Sunday evening “Friendly Hour” service, with guest speakers. In 1941 Curtis Beach, a student minister who was also a competent carpenter, was called to the pulpit. He got to work on the building, enclosing the parlor fireplace to create an altar for a small chapel and improving the choir loft. A parsonage was purchased on Courtland Street in 1949. On October 1, 1950, the church held its first coffee hour, truly a red-letter day. In the early 1960s, membership dwindled to a group of six remaining souls. In an act of vision and courage, they voted to sell the parsonage in order to hire a young, full-time minister, the Rev. Richard Fewkes. The gamble paid off. Membership surged. A number of teachers in the town joined at that time, which is still reflected in our congregational makeup. In the 1990s, the First Unitarian Universalist Society of Middleborough hired the Rev. Elizabeth Tarbox, originally from St. Albans, England, who in midlife had been newly ordained as a UU minister. A poet and an activist, she was one of the best preachers among new ministers in the denomination at the time, we’ve been told, and we also experienced firsthand. It was a little like having the power of a Jesse Jackson in a petite gray-suited English lady. Parishioners were frequently so moved, they sat in voluntary silence after the postlude, often with tears streaming down their faces. Membership boomed again, our religious education classes were bursting, and we undertook several curricula and social justice campaigns during this period. It’s hard to overstate how beloved she was. In 1993, a parishioner with young children, Patricia Tummino, was hired a few mornings a week to be our church secretary. In her first week, the Rev. Tarbox handed her a pile of theological books, and the two began discussing cosmology and the nature of God. Tarbox told Tummino she had the makings of a minister, asked her to preach a sermon, and was soon urging her to enroll in divinity school. In 1998, the church called Tummino as its next minister. Under her tenure, the church became a Teaching Parish, pioneered a Safe Congregation policy, and began to realize Tummino’s vision of “shared ministry” among the minister, music and religious education directors and congregation. When she retired in 2010 after 12 years, she was the church’s longest-serving minister.